Any more takers for meeting up at Joi (Indian restaurant in Kingsway) for the all you can eat buffet after Sunday's xc? Fill your boots for Â£6.95 per person, drinks and poppadums extra (that goes for the goldfish as well, Bondy ). 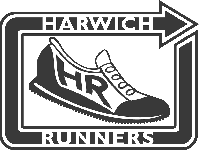 Current Harwich Runners record is shared between Colin K and Jason with 4 platefuls each! So far, have got 10 definites and 3 possibles-any more than this and I think we're probably going to have make an official booking to make sure we all get in. Let me know if you're up for it and I'll book us in for around 1.45-2pm (to allow for marshalls and course dismantlers to finish and the runners to have a quick slap round with a flannel ). Sorry Becky better knock Paula and I off your possibles. I will need to get home and type out the full results to send off to the other clubs. I need to get them out by about 6 pm to keep up with Halstead. Hoping to have done them by 5 for a PB, it is the only kind of PB I can aim for these days. Hope you all enjoy yourselves. Peter, if I'm not running then I'll bring my laptop down to the race & get the results online before most people leave. Thanks for the offer Graeme but I think I would rather be at home in the warm than in a cold barn. It takes ages, you have to type out all the runners names, clubs and finish positions, as well as team positions etc. If more than one club claims the same finish position, which happens more than once each year, you then have to go through the disks to see which club handed in that disk and so on and so on, can't wait. I have booked Monday off work in case I need extra time, it can turn into quite a job. All the clubs take a few hours to get them out and some don't get them out till Monday. That's if they let us back after last time. The staff at the Indian did look alot happier this time as they may have just made a profit out of us! I'm still convinced that we were knobbled-either an appetite suppressant or some sort of bulking agent was snuck into that curry I was so hungry after the race I could have eaten a horse (hooves included), but could only manage 2 servings (compared to 3 last time) Shameful!! Thanks all who made it along though-it was the perfect way to spend a post race afternoon! Def something fishy going on!!! !